METU Industrial Design Department third year students developed sustainability scenarios under the theme of “Home Hereos” for Profilo, the local brand of BSH (Bosch und Siemens Hausgeräte GmbH) in the fall semester 2011-12. Washit design project developed by Ahmet Burak Aktaş, Salih Berk İlhan, Adem Önalan and Burak Söylemez received the iF Concept Design special award, “Hansgrohe Preis 2012: Efficient Water Design: My Green Shower Pleasure.” Washit has been one of the six award winners in this special award category. 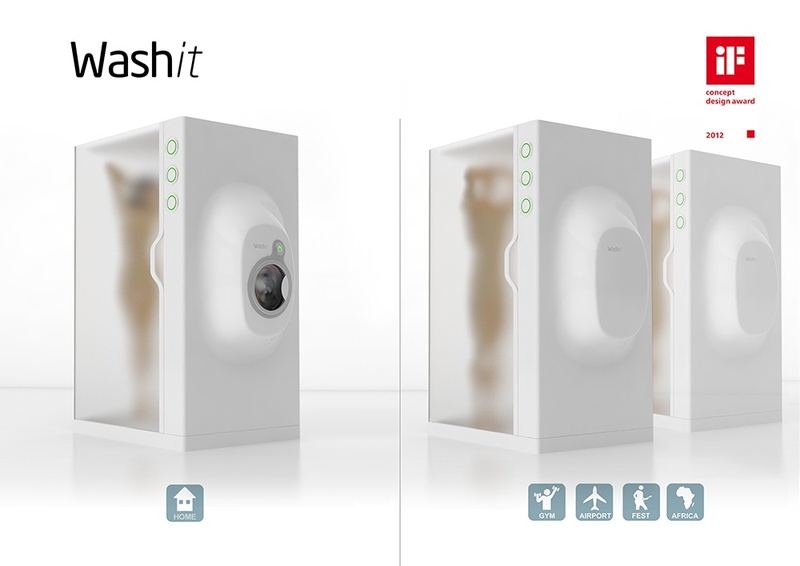 In addition to home use, Washit has been developed for public use at airports, fitness centers and festival areas. The design integrates the activities of taking shower and washing clothes into a cabinet, and reuses the shower water after filtering it to wash small amounts of clothes. iF Concept Design Award ceremony and the exhibition for the award winning projects will be held on May 31st, 2012 in Hamburg, Germany. Within the context of “Home Heroes” project, the sustainability scenarios developed by the third year students and the product design projects developed by the fourth year students were also published in a catalogue.